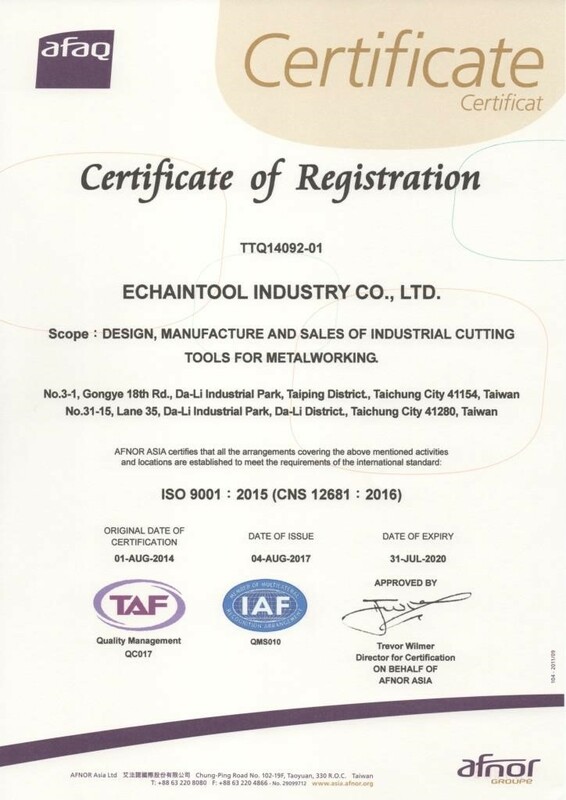 About US, A top brand cutting tools producer in Taiwan Echaintool Industry Co., Ltd.
A Pioneer Leads Taiwan Cutting Tools to World Market Arena. Echaintool Industry Co., Ltd is a professional manufacturer of metal cutting tools and turning tools. We are the leading and famous cutting tools brand in Taiwan. Having 3000 different kinds of items and ample stocks meets customers’ needs. 90% products provide our own brand tools and 10% to do OEM project for world-class cutting group. All of our products are made in Taiwan with highly quality. Our products won Taiwan Excellence Award to prove our quality capability. High innovation and plateau of quality includes worldwide ISO 9001 certifications, along with direct certifications from many aerospace, automotive, and Die, Mold companies in the world. We are looking for the overseas agent. If you are interested in our proposal or you have any questions and requests, please do not hesitate to contact us. Wherever there are machine tools, there are ECHAIN Cutting tools.